Scientific Dust Collectors' (MP) Vertical Cartridge Collector and (MPL) Small Vertical Cartridge are economical cartridge units that utilize the patented supersonic nozzle cleaning system as well as a high-side inlet so that the heavier dust falls out of the air stream. These features allow the collector to operate at higher air-to-cloth ratios and provide longer filter life. In the MP Series & MPL Series, the cartridges are mounted vertically with a unique spring-loaded mechanism that applies a constant upward force to maintain a constant seal at the tube sheet. Since gasket leaks are common in cartridge collectors, this spring loaded mechanism eliminates this problem. Scientific Dust Collectors guarantees never to have a gasket leak inside our cartridge collector. 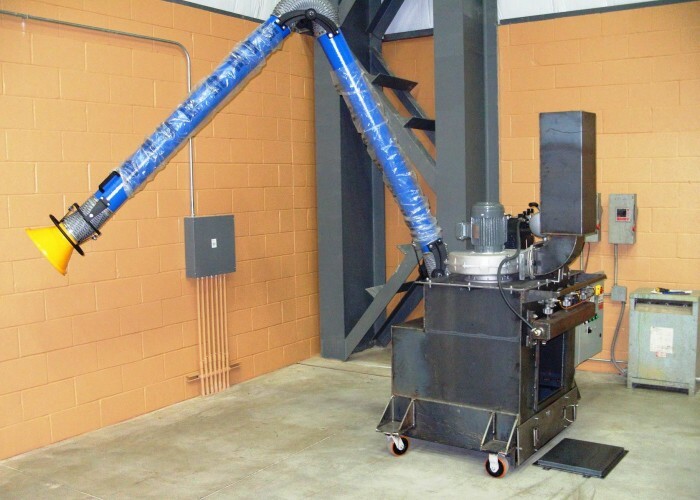 With our patented cleaning system, our units operate at higher efficiencies using less media.